Is B&Q generally frequented by thick people? 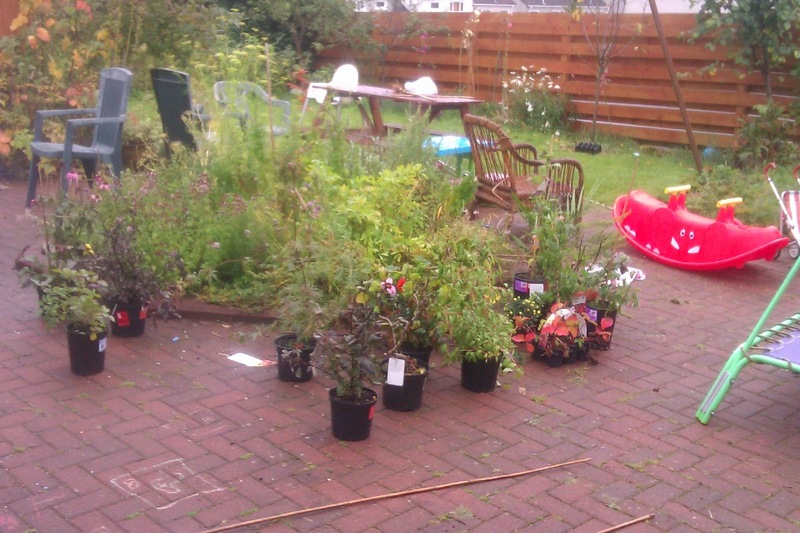 We were in yesterday and they had reduced a lot of their plants from about £15 to between 50p and £2. Ninety per cent of the customers were giving these rather scabby offerings a very wide berth. Thomas and I did notice immediately that if we just checked the label on each, it stated quite clearly which plants were hardy and therefore a great bargain as they'd be back next spring or summer looking as good as new. I had been wanting a blue hydrangea all summer but at £20 I couldn't bring myself to buy one. Once the remaining pink one they had in stock had been reduced to £1.50 simply because its flowers were starting to look a bit faded, I suddenly found pink much more appealing than blue! Four and five will like pink best anyway. Even if only one in three of the plants we bought survives, and there's no reason to think they shouldn't all survive, we managed to spend £18 yesterday on over £250 of plants. Just add some aluminium (http://www.hydrangeashydrangeas.com/colorchange.html). A great result indeed. All of my garden plants have been bought when reduced and they are flourishing! Wow, you got some bargains there! I used to work on a garden section at a similar place. Things get reduced by such massive amounts, often very far below cost price because nursing plants back to health would take up a lot of space and make the place look untidy - better to let them go dirt cheap than chuck them in the bin. It's the best time to buy plants, although you'll inevitably miss a few good ones. Anything that flowers for a brief period like Rhododendrons and Camellias for example will be half price or less once they finish for that year. With trays of bedding plants - if a few are dying or missing, the trays will be greatly reduced in price and often have good plants left. With compost, a split bag will be reduced in price by 1/3 at least - even if there's nothing missing! When I used to mark down plants, I'm afraid I was the one knocking a pound off here and there, whereas other staff would go straight to half price or less. Some things really just didn't warrant much of a reduction. Like someone has said about the hydrangeas - there are things available to change the colour, but it will only work properly on newly emerging flowers. Flowers already out will go a funny shade in between blue and pink.